Formosan termites (also known as Formosan subterranean termites) are an invasive termite species that originally ranged throughout southern China, Japan, and Formosa (now known as Taiwan.) Sometime during the 20th century, these pests became permanently established in the continental United States, Hawaii, and South Africa. Often nicknamed the “super termite” because of its unusually destructive habits, the Formosan termite colony can contain several million insects; most other subterranean termite species create colonies containing far fewer individuals. Formosan termites need warmth to survive; their eggs will not hatch at temperatures beneath 68 degrees Fahrenheit. If you live in an area where temperatures rarely warm up, it’s likely that your property is not at risk of a Formosan termite invasion. In the United States, they are most prevalent throughout the southeast states, California, and Hawaii. These social insects build colonies either below or above ground. Like other termites, they have a caste system consisting of workers, soldiers, and winged reproductive; each colony also has a king and a queen. A Formosan termite queen is capable of living as long as fifteen years, and is capable of producing as many as 2,000 eggs each day. Worker and soldier Formosan termites can live for as long as three to five years apiece. You can identify Formosan termite swarmers by their yellowish-brown bodies and their long wings, which are about twice the length of their bodies. Massive swarms emerge during calm, humid evenings between April and July; they usually occur right at dusk. These reproductive swarmers are attracted by lights as many insects are; you’ll often find them near outdoor light fixtures and around windows where light can be seen from outside. Formosan termite soldiers look very much like other termite soldiers; they have strong pincers and sturdy heads connected to pale, yellowish bodies. When disturbed, they will readily attack; in addition, they can be seen secreting a glue-like white fluid from an opening in the head. Worker Formosan termites look much like other termite workers; they are eyeless, gelatinous-looking, greyish-white to yellowish-brown insects that rarely enter the light of day. Preventing Formosan termites is much like preventing other types of termites; building with pressure treated wood is recommended, even if all you’re constructing is a seemingly unimportant outdoor structure like a swingset or a sandbox for the kids. Look out for leaks and other moisture sources, as these termites require a combination of water and cellulose to thrive, and consider applying a chemical barrier containing permethrin, bifenthrin, imidachloprid, or fipronil to the area between a structure and the point where it comes into contact with soil. Population control may be achieved via the use of baits; these are usually applied by professional pest treatment companies although there are some brands that are available for homeowners to purchase. Formosan termites will eat anything that contains wood fibers (cellulose) as well as plants of almost all types, including crops like sugarcane. One of the most common signs of an infestation is the presence of an extensive network of tunnels and galleries or chambers through wood structures, wood piles, trees, and underground. When this particular type of termites invades a structure, it’s common to find foraging tubes that connect the infested building with soil tubes that extend into the surrounding area. This network can extend for as far as about 300 yards per colony. Another sign that Formosan termites are invading is the presence of alates, or winged termites, which swarm forth once mature in order to establish new colonies elsewhere. After mating, these reproductive termites shed their wings; lost wings are another sign that Formosan termites could be present. If you have a Formosan termite infestation, consider it an emergency. 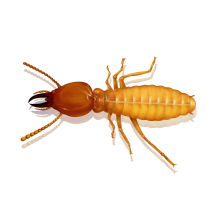 When living in a mature colony, Formosan termites are capable of consuming about 13 ounces of wood each day. They can cause severer structural damage to any wooden structure – including everything from trees, to a wooden boat to a high rise apartment building – within just about three months. It does take up to three years for a colony to reach a size capable of causing this level of destruction, however these termites are notoriously difficult to eradicate since colonies have such a wide range. If you think you have an infestation that’s just beginning, you can take steps to control it on your own. If you’re seeing a lot of activity, consider calling in a professional exterminator. Use our guide to termite extermination to gain insight on selecting an exterminator who can not only eliminate these termites, but who can prevent them from returning in the future.